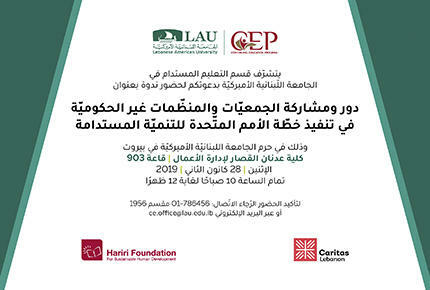 The Continuing Education Program (CEP) at LAU is hosting a panel discussion on “The Role of NGOs in the Implementation of the UN’s Agenda for Sustainable Development”. In the summer of 2018, Lebanon presented its First National Report on Sustainable Development Goals (SDGs) as part of the United Nations’ 2030 Agenda for Sustainable Development in New York. The agenda was previously approved and adopted in 2015 by 193 nations, committed to a set of goals that seek to eradicate all types of poverty and to achieve a more sustainable world, addressing challenges such as governance, health, women empowerment, and environmental sustainability. In that spirit, the discussion will involve the two major organizations that drafted the report (Caritas and Hariri Foundation), in addition to a representative from the Lebanese Government, in order to present the roles that local NGOs and the civil society should exhibit to conform with the implementation plan of the SDGs. Kindly note that the discussion will be in Arabic. Please confirm your attendance at 01-786456 ext. 1956 or ce.office@lau.edu.lb.